Original owner: Izaak Van Koeveringen (1815-1881). Brought along during the Great Netherlands Migration to America in 1847, settling in what is now Zeeland, Michigan. Note: The Van Koeveringen Family sailed on the ship, the Princess Sophia, organized by Rev. Cornelius Vander Meulen, co-founder of Zeeland, Michigan. The ship left on May 11 and arrived in New York on July 6, 1847 with Izaak, aged 32; Adrianna Sonke, aged 37; Johanna, aged 13; Stoffel, aged 9; Antoni Johannes, aged 6. Next owner: Antoni Johannes Van Koevering (1841-1899), youngest child of Izaak. Next owner: John Van Koevering (1871-1953), third child of Antoni, and a lifelong carpenter/cabinet maker. Next owner: Lavern G. Van Koevering (1920-2002), youngest child of Christopher Van Koevering, John's younger brother. 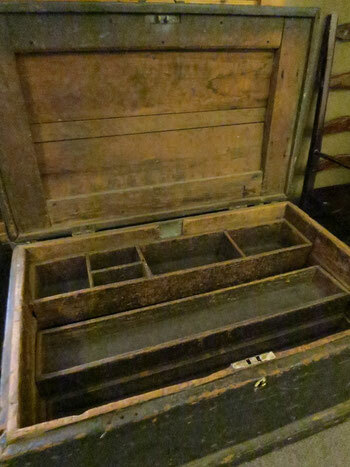 Lavern was his Uncle John's favorite nephew and Uncle John gave the toolbox to Lavern about 1947. Next owner: Daniel S. Van Koevering (1947- ), eldest son of Lavern and distant cousin of Kurt Van Koevering, owner of the Zeeland Record. Current owner: Zeeland Historical Society. Donated by Daniel Van Koevering and his siblings, Cathy, Patricia and Mark, on behalf of all descendants of Izaak Van Koeveringen - January 27, 2016.